Tanyana Vladha was a master architect, one able to manipulate pions, the very stuff that makes up the world, capable of creating wondrous works. Until a bizarre accident causes her to lose her ability to see the pions. She wakes to find herself bound within a strange technological suit, cast down to the lowest of the low; a collector of debris, a mysterious and dangerous substance that comes from working with pions. As she comes to terms with her new situation, things seem to become more complex as incidents start occurring, and dark conspiracies are revealed. Jo Anderton’s debut novel is a compelling tale which pulls you in right from the start. Debris is told from the point of view of the protagonist Tanyana, and as the story progresses she searches for the truth behind her change of circumstances and meets a number of interesting characters along the way. Like debris technician Devich and the debris collector Kichlan and his dimwitted brother Lad. The world is beautifully described from the point of view of one who was among the privileged of society and saw it from that angle only, just to have her world turned upside down and be given a view from below. As Tanyana seeks the truth she finds that many things are not as she believed or as they seem. I read this wonderful book as an electronic ARC from the publisher Angry Robot Books. 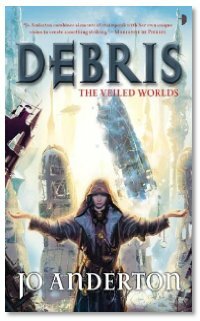 I would highly recommend Debris to any fan of Sci-Fi or Fantasy. I am eagerly awaiting the release of the next book in the Veiled World Trilogy, Suited, currently listed for release summer 2012, and hope to check out other works by Jo soon. So please, give Debris a look, I'm sure you will enjoy it. Sounds really good. I may end up picking this one up!